Quintessential California Coastal Style. From the moment you enter you will recognize youâve arrived at a very special destination â a place youâll love to call home. 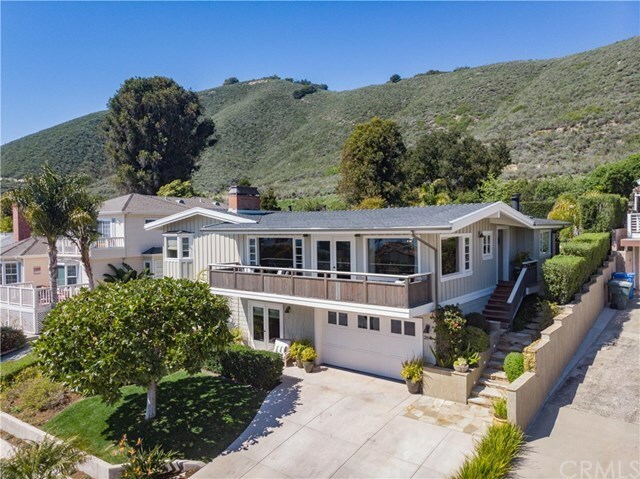 Peaceful and serene, this thoughtfully remodeled Shell Beach home defines fabulous style and design while retaining its classic integrity. Light streams in from all directions â ocean views are framed by windows and doors leading to the front deck. The kitchen is the axis of activity with generous cabinetry and an over-sized stone clad island â ideal for prepping meals and entertaining. The living room and dining room are an extension of the open concept â each space flowing into one another. The lovely palate of this home along with the Siberian Oak hardwood floors provide the cohesive texture throughout. This space continues through French doors to the enclosed outdoor living area offering shelter from the elements. The master suite is spacious and serene - absolutely Luxe. The bathroom features a walk-in shower & separate soaking tub. It is completed by an enviable walk in closet, fireplace and French doors to the backyard garden area. Auxiliary bedrooms have private en-suite bath accommodations â Downstairs offers autonomy with one bedroom as well a terrific family room ideal for guests or cozy evenings by the lower level fireplace. This home lives larger than you can imagine â integrating the indoors and outdoors seamlessly a true lifestyle oasis. Directions: Shell Beach Road to El Portal. Home is on the right side of the street.